I didn’t get any sewing done because we had a SF Bay Area Pattern Review get-together. What a fun time. I don’t know many garment sewers in my town, so it was really cool to meet with other garment sewers. We swapped fabric, patterns, and books. I unloaded 14 yards, but I think I went home with just as many. KS 2788: Gads! Sewing when I’m tired is hazardous. Fortunately, I was very cautious while taking in the skirt. 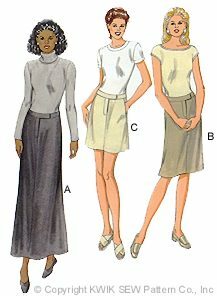 I had measured my hips, sitting 51″, and was using that dimension to determine the total ease (standing) in the skirt. I basted the skirt making the maximum dimension 52″. I tried on the skirt again. It’s way too big in the high hip and waist. I’m having trouble pin fitting because I have all this excess fabric in the seams, like 6 inches at the waist. Since it’s too big everywhere, I decide to serge off the excess seam allowance. Well, instead of running the skirt thru the serger with the needle in the basted seam line, I cut off the seam allowance at the basted seam line. PRIMAL SCREAM!!! Since everyone else in the house was asleep, it was a quiet primal scream. Fortunately, I had an extra inch in the seam allowance, and I know the skirt won’t be too small standing up, but I really wanted to avoid horizontal wrinkles from sitting. KS 2788 I finished the zipper, decided to use the grey zipper, the center front seam, the center back seam, and the back vent. I sewed the sides together. It was enormous. To determine the width, I measured my widest dimension sitting, 51″, which means that the half measures should be 25.5 inches. The skirt is currently 29, so I took in each side 1.5 inches. I want to fit the waist before I decide to get rid of that last 0.5 inches in the sides. The waist is about 12 inches too big. I’m having trouble pinning in the hips. I’m terrified of making the skirt too small. I purchased 6 yards total of cotton interlock, 1/2 oatmeal and 1/2 lipstick pink, from Fabrics & Notions Co-op and ordered 6 yards of silk jersey, 1/2 eggplant and 1/2 natural. KS 2788 I managed to use up 3 yards of fabric so far in cutting. Adding the 5.75 inches to the waistband made a big difference. The waist band was too wide to cut on the fold. 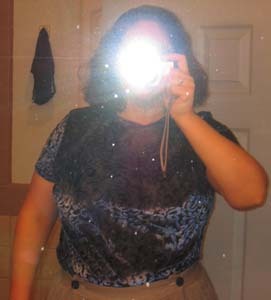 I omitted the pockets on this skirt. It’s easier to fit without pockets. I serge finished the center front edges and centerback edges before sewing the fronts and back together. I don’t have a brown 9 inch zipper in my zipper stash. Which reminds me, only buy a zipper grab-bag if you have need of a lot of really short zippers in odd colors, like orange. I decided to work on the back vent, since I couldn’t finish the front. The instructions told you to do the darts after sewing the 2 backs together. That doesn’t make any sense to me. The smaller the piece of fabric, the easier it is to handle. I sewed my darts in before sewing the backs together. KS 2788: I drew the seam lines on the pattern pin and fit the skirt using safety pins. Safetypins work so much better than straight pins. It’s really hard to fit a straight skirt by yourself. I tried to fit the back in the mirror. I tried to fit the back by finding the center of my back and buttocks with touch. I tried to shift the pattern pieces so that the centerback was in the centerback, then measure the offset in front. It was really hard. I had less trouble with my Thalia Pants. Of course, the pants are very full, so it was only the crotch that I was fitting. In the end, I decided to add 3 inches to the stitching line and use a 1 inch seam allowance, followed by basting and pinfitting the garment. SD 294: Finished the crop top. DD thinks it is too short to wear without a shirt underneath. KS 2788: Traced an XL view A.
I took DD with me to Joann’s. I needed some more sewing machine needles. We ended up buying 2.25 yards of fabric. 1 yard in turquoise swimsuit fabric to make dance clothes for DD, and 1.25 yards of a grey tiedye burnout panne to make another KS2565 for me. So far this year, I’ve bought 15.875 yards and consumed 10.367 yards. I had been debating whether or not to prewash some silk tweeds that I have. I did, and I’m not sure I’ll do it again. The prewash was kinda rough on the tweeds; one ran.